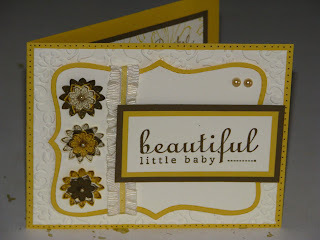 Here is the card I made to go with my sister-in-laws diaper cake for her baby shower. I had bought a yellow party dress for the baby that is covered in lace, pearls ,satin and flowers so I used that as my inspiration for the card. I used delightful daffodil , vanilla and suede paper, vintage wallpaper folder, boho flower punch, matching ribbons, the top note die , pop dots, and co-ordinating pearls.